Tonight's an emotional night for me. 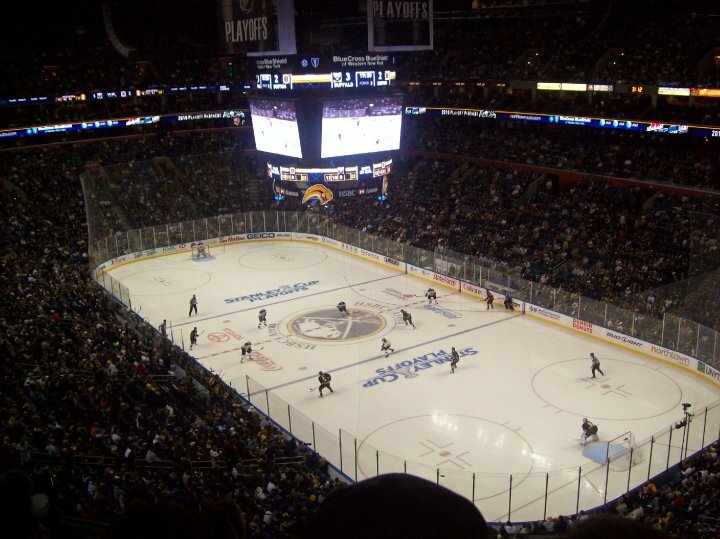 The Buffalo Sabres 2009-2010 season came to an end after a 4-3 loss to Boston. It was a first round playoff exit; the Bruins won the series 4-2. It was so nice to be back in the playoffs again after a two-year drought. And as long as the team is exciting on the ice and working hard, I'm generally content, win or lose. That was the case this year and it was a fun ride. But this was particularly tough for me. This whole series has been tough, from the opening day of the playoffs, when I wanted nothing more than to be back home in Buffalo with all the buzz. In fact, the mere idea of playoff hockey in Buffalo causes memories of the good old days to rush through my mind. So among the reasons the last 12 days have been really difficult: This was the second year I had tickets to all the Sabres' home playoff games (every one of them!). Of course, many of these tickets won't be used because we're done now. But the last time I had tickets to every home playoff game was in 2006-2007 and I was going to school in Rochester at the time. Now I'm in New York City. Being so far away, yet owning tickets to all the games, is brutal. I did get to one game this playoffs (Game 2 in Buffalo, a Saturday afternoon game, which we lost sadly 5-3, though it was still incredibly exciting). I was hoping for a much longer run. It's a whole bunch of emotions I'm experiencing. Most of all, after an emotional playoff exit like that, it's longing for friends and family, which I was so used to growing up. No one's here. I'm alone tonight in my apartment. It's sad. I'm OK and all. You could kind of see the end coming. But in December when I first moved to New York City, the Sabres 09-10 campaign was alive and well. I watched as the Olympics took place, and Ryan Miller led Team USA to the silver. And these playoffs were supposed to be extra special, with Miller leading the way -- the league's best goalie (possibly MVP, we'll find out soon enough). Just tough, that's all. 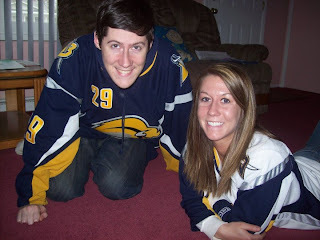 I had a Sabres Playoffs Tumblr blog too, documenting all the action. And it's sad that had to end so soon too. Of course these are all temporary emotions. And time will heal them. And the Vancouver Canucks (my second favorite team since I was a kid) are still alive and well in the playoffs, and now I root for them. And there's always next year. 0 comments on "Sabres 09-10 Season Ends In Boston"